Roundtree, Kenneth, head-of-household, age 33, born in Virginia; parents born in Virginia; rented home ($55 rent); radio in home; occupation: clerk, trunk & bag factory; World War I veteran. 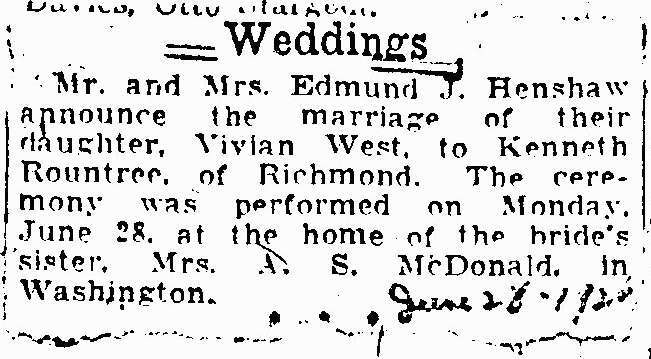 Roundtree, Vivian H., wife, age 29, born in Virginia; father born in Virginia; mother born in North Carolina; occupation: clerk, bank. 1910 census, Brookland District, Henrico County, Virginia; roll T624-1631, ED 29, page 3A, line #37, dwelling #43, family #51. 1920 census, Richmond, Virginia; roll T625-1911, ED 114, page 9B, line #77, dwelling #147, family #183. 1930 census, Richmond, Virginia; roll T626-2475, ED 7, page 24A, line #33, dwelling #151, family #228. Edmund James Henshaw, Jr. obituary.